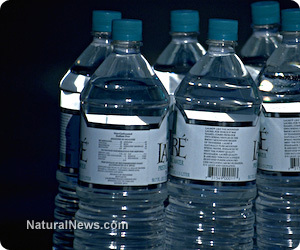 (NaturalNews) Despite countless scientific evidence explaining the dangers of Bisphenol-A (BPA), the Food and Drug Administration (FDA) refuses to ban this highly profitable industrial chemical. In their "current perspective on BPA" the FDA now states that the chemical is "safe" at the exposure level listed on current product packaging. Bisphenol-A is an industrial chemical found in many metal-based food cans and hard plastic bottles. It has been used since the 1940s and has evolved into a major industry, with over six billion pounds of BPA produced globally each year. With this much synthetic chemical running amok in the land and water, there are definitely consequences. In fact, BPA is a synthetic estrogen, which means it can disrupt the endocrine process in the body, manipulating estrogen levels. This affect has been scientifically linked to developmental disorders, cancer, heart disease, diabetes, early puberty, learning disabilities, and infertility. Companies that manufacture BPA like Bayer, Dow, Hexion Specialty Chemicals, SABIC Innovative Plastics, and Sunoco need to look for more health- and environmentally-friendly ways to produce their products. BPA is responsible for infertility that is growing at an alarming rate. Take, for instance, the growing rate of hysterectomies - a surgical procedure that removes a woman's feminine parts. This procedure is simply the medical establishment's reactionary response to a women's infertility. This procedure now occurs 1,616 times per day in the United States. BPA definitely plays a role in disrupting a woman's hormones, causing fibroid and cysts that beckon infertility. The medical establishment only knows how to respond to infertility with surgery. Correcting the root problem of infertility by eliminating toxins is usually discarded as a waste of time, but detoxifying feminine parts with cleansing herbs is a very practical way to preserve a women's fertility. After years of claiming that hormone-mimicking BPA was "safe for all uses," the FDA came out in 2010 and changed its stance. After assessing new scientific data at the time, they began to show "some concern" that the affects of BPA may be dangerous on infants and fetuses. They went on to support efforts to rid the chemical from infant formula cans and baby bottles. Now, in 2013, the FDA is stating that the BPA exposure listed on today's packaging is perfectly "safe". How can their off and on claims be trusted? A chemical not fit for children can't be any safer for adults. Sadly enough, most tests on BPA exposure find that 93 percent of urine samples contain trace amounts of BPA. This statistic suggests that most people are now walking around with synthetic chemicals in their body, harboring a disrupted hormonal structure. This hormonal havoc may even be contributing to bizarre mating habits and the loss of gender identity, especially during puberty. As BPA fills the land and the water, it is poisoning the wildlife as well. Researchers from the University of New Orleans and the University of Minnesota published a study on the affects of BPA on fish populations. Their research suggests that by disrupting the fish's hormones, the BPA causes changes in the behavior and appearance of the fish, which leads certain species of fish to breed with different species. The research found that BPA exposure affected female mating choice. The female fish becomes confused by the changes in the male fish's appearance and behavior. The tough question to ask, "Is this happening in the human population as well? For the human population to thrive, males and females must remain fertile, reproducing, growing as strong functional families. When chemicals like BPA run rampant, polluting the people's consumable goods, the ability to reproduce, think and function optimally is replaced with synthetic hormonal disruptions. If BPA continues to be produced at the rate of six billion pounds annually, then the Earth will depopulate, change its mating habits, as infertility erodes a population who may lose their gender identity altogether.